Date: 11.11.12 / 17:00 / Refugee Protest Camp am Oranienplatz, Berlin. Rex opened the conference introducing Alassane Dicko, who started by telling us how difficult it is for western-African societies to understand the occidental's concept of deportation. Once the deportee has not committed any crime, there should be no reason for deportation. He emphasized that deportation is dramatic. It is a violation of the human dignities. It revolts the society who receives back the deportee. Those who are doing it, do it in our name and we have to say no, to stop being victims of such arbitrary. Migrations to the Malians also have a different concept: the presence of migrants enriches their society and someone who leaves to Europe is seen as someone who wants to gain knowledge. In comparison, the western-European countries, have as a basic principle not to allow people from certain areas to enter their territories. Even from areas where there's been a climate catastrophe, sometimes created as a result of capitalist policies. He then gave himself as an example: he went to Belgium, where, after studying for two and a half years, he was offered an internship, which he couldn't take because the Belgium authorities didn’t give him such a permission. „There are no barriers blocking us to breath the same air, but this system pushes people to forests, to the underground, one day they will send people to another planet. „ said Alassane. He then finished the introductory part by thanking organizations such as No Borders, The Voice and The Caravan for being involved in the Break Isolation struggles. Question 1 to Alassane: what difficulties Malians have when they go back as deportees? Alassane: a person leaves freely and comes back in a forced way. It is difficult for the deportee to understand it. Many are afraid to go back to their families, cities in order to avoid having to tell what happened. It destroys the person. The direct consequence of deportation is very bad for society because it shows that racism is still going on. Our societies are revolted about deportation because it's done by countries who say they are democratic. Question 2 to Alassane: how Mali is being affected by the crisis in the Northern Mali? Alassane: Around 230,000 people have fled their homes in the north of Mali to the South Mali. Many women and children are affected by violence, by the Sharia, which forces them in to marriage at the age of 12 with a man who is part of the movement in the north. Our organization works with women and children psychologically affected by this extremism. Second aspect of this crisis is the fact that this part of Mali has had seasonal migration to Mauritania, Algeria, Morroco and now they can't go back home. They are forced to be migrants. Question 3 to Alassane: from the point of view of the Malian government, deportees, once back, are free to live their lives or are they imprisoned? Alassane: deportees are free to live a normal life, which is not the case of Senegal, where deportees are interrogated by the police for weeks after arrival. In Mali is different. We have a strong civil society. We know that a deportee is not a criminal. We have a transition government, which is very complex because it is a result of a coup d'état, but we are trying to find a political solution to the problem. in 2008 Senegal signed a repatriation treaty with Spain and admitted 60 people even though they were not originally from Senegal. Readmission was already shocking, but worse because these people were kept in detention centers. In Mauritania, there is a detention center called „Guantanamito“, also a result of a treaty with Spain. Concretely, Mali is the only sub-Saharan country who hasn't signed a treaty with France or other EU country over deportees. The USA and western-European countries want us also to close our borders, but we have inherited a tradition of freedom of movement. Alassane: the consequences are already there. There is a network working about these borders linking the work of other organizations at the borders of Senegal, Algeria, doing reports, going to see institutions, showing the results of the violation of the human rights. We created the „Justice without borders for migrants“, we have reports and we would like to present it them to the court of human rights, to show the responsible. We don’t know if it will be possible, but we will try. It is important also to emphasize our work at the airport. We are there every day, not to integrate deportees in the society, but to prevent deportation. Between 2007-2009, 17 deportees committed suicide. There is a hill in Mali called the Hill of silence, from where people committed suicide. In 2010 Malian workers living in France went on vocations to Mali and when they tried to go back to France, they couldn't embark in the Air France flight. Even the Malian authorities intervened and told Air France they couldn't do that in the Malian territory that people should be allowed in the flight. Same years ago Frontex came with a plane, we mobilized people through the radio, and the plane could not land because it was not a tourist flight, it was a plane with prisoners’. We told the population by radio. The airport was small and we could stop the landing. Rex: there is a war against migration. In the 19th century Europeans were moving for reasons not so different from the situation Refugees are faced with today. At that time some of the young people left based on oppression from the privileged class in the spirit of Revolution but what made it different was that they had a destination and the possibility to come back home. instruments like the Dublin II regulation, prejudiced and hatred based on policy of who should be allowed to stay or not. Europe destroys the people they pretend to protect and Refugees are practical instruments to try the different types of unjust laws that keep their propaganda. The intention is to keep us under constant control to prevent the revolution. They come up with different faces of compromise like Bleiberecht to show that they are nice and respect humanity but maybe just two benefits from this law and broadcasted in the wide media but 2000 refugees has to be dearly persecuted for that by deportation or otherwise. They say we are economic refugees, but this is also political because we are here because they destroyed our lands. On Monday you have to be there to collect your letters; Tuesdays and Thursdays, you have to be there to collect your food vouchers, which you must do it personally. On Wednesday there is the doctor and on Friday the office closes at 14h and if you leave the Lager, maybe you will end up having to sleep in the Bahnhof. So, refugees are not only fighting for papers, we have to fight the system. And how do we work together: the protest march came in a good time. Germany has a strong network, practical instruments. In 2004 they introduced the fingerprinting system, first to the refugees, then to football players and then to the left wing activists. So we must fight the system together. Regarding the Nigerian embassy action we have to fight the ideology, the mentality of Nigerians who are against the occupation of the embassy. We have to empower our network, our structures, also with those Nigerians who are here and also with those in back home in Nigeria. We would have expected the Nigerian Government to take a legal action against us for having occupied the embassy but the reverse was the case, they gave us out to the German police to brutalize even right from inside the embassy (Nigerian territory as it was expected to be). Notwithstanding that, they never asked about what happened to us to confirm the utterances of the Police who identified Nigerian government as being too irresponsible to ask for us. Then it’s a question of who the Nigerian embassy is standing to represent here in Germany. It was a personal experience of what happened to our ancestors in the period of the western occupation of our lands. We have no other option but to empower our structures to confront the whole system. Question 1 to Rex: why don't we work the question of the Lagers from the perspective of the business, of the profits they make with the Lagers? Rex: this is not new. In Katzhütte we made this investigation to make it clear that the Lager was costing a lot to be kept. In Bayern also, many reports published this relation of how much it costs to keep a Lager, people from the local communities couldn't even believe it cost so much to keep such places. Question 2 to Rex: there will be a deportation, on the November 15th,, of Roma, in Stuttgart and I would like to participate. How do I do? 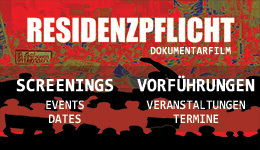 Rex: tomorrow there is a meeting in Stuttgart to discuss how to work against this deportation. It is the first meeting of a Network to monitor deportation in Stuttgart. Rex: we have to keep the scandal public, to show the role of the Nigerian embassy. I spoke politics but I want to say something social, to the European youth: the world belongs to you and it is your duty to change it. A young migrant is assimilated to drugs, prostitution. Not even parents who smoked lots of pot would tell them to go and sell drugs and here they are consuming and selling drugs. European youths are allowed to have an open bottle in the pockets of their jackets, it is normal to the European youth to go to parties. It is normal because there are the hormones, the adrenaline. The young migrant, when they want to break isolation, they have to go to parks because they can not go to bars, clubs. There is nothing written, like they write about dogs: „dogs not allowed“, but it is the same thing. Their money is not accepted in these places and they fear facing this non-acceptance, so they go to the parks. Grass is anti-depressive, even the Europeans recognize it as an anti-depressive, but blacks cannot take it. I say good night because I like to move.